Click the picture for a video. Like usual, we were rather late with planning our race season. Karsten, who had had a knee operation the summer before and inofficially retired from races like Femundløpet, would take it easy. We had realized that Finnmarksløpet would be hosting the World Championships of IFSS and thought that could be an interesting goal for our team. However, I was not so sure about it. Not being much of an outdoor hero myself, was I up to the challenge? By the time I had gathered courage to sign up, it turned out the entry had already opened few days earlier and limits were met the same day. It was a kind of relief to me and since I could not be bothered to sign up for a waiting list, we just forgot about the race. A week or so later, I was contacted by the Swedish Sled Dog Sport Association asking if I would like to represent Sweden in the Nordic Breed class of the championship. They could guarantee me a place as part of the quota which every country was allowed for, on the condition that I had to decide the same day. And, that is how it came about. During the entire autumn and winter there was this one goal. Even though I was not really thinking about Finnmarksløpet, it was there 'nagging' in the back of my mind and all training was targeted towards. Winter was again one with numerous challenges as it really didn’t look like winter. We got snow in December, but it was not until the middle of the month that we were able to train with sled in the nearby mountains, trucking the dogs. Around Xmas we could train from home for few days, then snow disappeared and it took until half January before we could sled from home again until exactly Sunday 8 February, when it started to rain and all became ice, and it stayed like that until our travel to Alta on Tuesday 3rd of. March. Three weeks before Finnmarksløpet, on Friday 13th February our team started in the Tobacco Trail, an open race over 305 km. in vicinity of Kiruna. I had been told that the trail was not very technical and Karsten encouraged me to race a 12 dog team in order to be able to pick the 8 final dogs for my Finnmark team. I am not particular fond of running big teams with sled because there is too much power I feel. The most I had run so far was a 10 dog team in a 300 km race two years earlier. Our bad snow conditions also did not allow for running big teams with sled, so when I started on Tobacco Trail it was the first time ever for me to run a 12 dog string and second time to run a 300 km. race. In addition, I was also testing a new sled. It was a relief to me that the trails were flat and not very complicated which kept my nerves in check. We were going to take it easy, it was after all only a training race for us. The team existing of Puak, Thor, Bo, Molly, Kvitten, Flapper, Kahlo, Erasmus, Voltaire, Lorentz, Rohn and yearling Pamuk was cruising great from start. The dynamic compared to an 8 dog team is quite different. Already after few kilometres after start, I was able to catch up and hang on to fellow Siberian Husky team of Leif Herleiksplass who, with his 14 dogs, passed team after team and I just had to hang on. When we had passed a good number of teams, I thanked him for the help and asked for the trail. The dogs ran super and I was enjoying the ride. In the first checkpoint of Övre Soppero after 61 km., we stopped for time equalization and 2 hour mandatory rest. It was obvious my routine at the checkpoint needed improvement. I needed full time to take care of my dogs and had no rest nor food myself. This inefficiency was a first mistake. It was dark when we drove out of the checkpoint. The second leg of 80 km. to Saivomuotka was going great until my headlamp battery quit. In the hurry to get my spare battery attached, the cable broke and what now? I drove on in pitch darkness but got a tangle in the team and had to stop. I remembered I had a spare head lamp in the side pocket of the sled and stopped the team again to look for it. When I finally found it, there was no battery attached! Frantically searching for the battery was to no avail, it must have fallen out of the pocket. Behind, I saw the other teams like a string of lights approaching. One team I had to let pass, but I was not letting a second one go by and decided to drive in front with the light of the team behind me to guide. The gentleman driver was very helpful and thankfully, we made it to the checkpoint Saivomuotka alright, 140 km in the race. To my big surprise we were even in 4th position. It was yet another lesson to learn though; always have a extra light mounted on the sled. And of course, the battery was in the sled but I just could not find it in the dark. It was bitterly cold in the checkpoint at 2.30 hrs. in the night. Here we had a 6 hours mandatory rest. The cold made the snacks for the dogs hard as a rock. Even with the boiling water from the cooker, it was difficult to thaw the food. Rohn had shown a slight limp coming into the checkpoint and I dropped him to avoid more harm. He had been doing really well. We left the checkpoint at 8.30 hrs. in the morning in a chilly temp. of -32C. with 11 happy dogs. The team that was in third position had not started out yet. A snow machine with drag to prepare the trail was going out just in front of us. Only few hundred meters from the checkpoint it got motor stop and we had to wait for a moment until it got going again. My dogs were now running in a cloud of exhaust that hang over the trail for several miles. Not the best start of our third leg, but not much to do about. It was a cold, though beautiful sunny morning. The dogs worked steady but were not very inspired by the trail. We were on our way back to checkpoint Övre Soppero, driving the same return way as we came, but now in daylight. The well prepared trail was going in the flatlands around Kiruna over vast open areas. We did not see any wild life or reindeers, but met a skier and were passed by the team that had started out behind us. When we came down to the river, not far from the checkpoint I noticed Kahlo started to limp. I was quite sure it had something to do with the tangle of the team the night before. She was dropped when we came into the checkpoint, she had been doing a great job over 220 km. 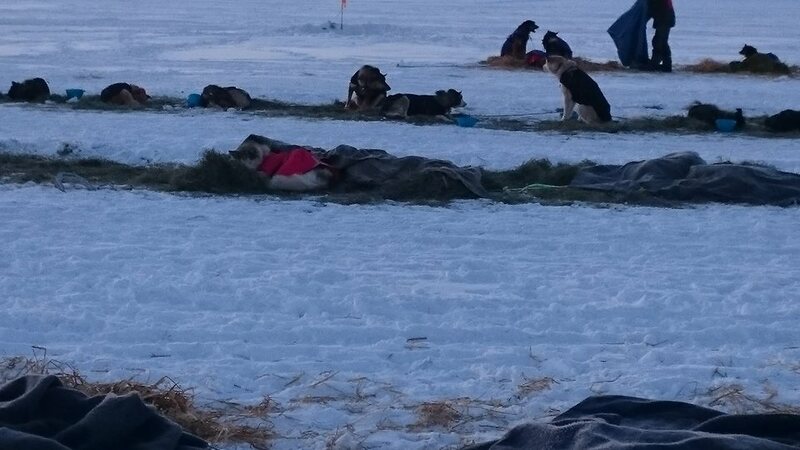 The dogs were eager to rest in the straw and sleep. After another 6 hours mandatory rest, we were about to start on the final leg of 84 km. towards the finish in Kiruna. It was few minutes to eight in the evening and still getting colder. Puak who had been in lead together with Thor all the way, was showing some stiffness in his shoulder when we were about to leave. Although he got much better after I massaged and warmed him up, I decided not to chance him. He is a such a key dog on the team and the idea of having to start Finnmarksløpet without him gave me shivers. Puak was dropped, but when Karsten walked him to the car he was completely fine again. When I took off the heavy wool blankets of the dogs and trying to put them nicely back in the bag, my fingers got so cold and started to get stiff that it was hard to use them. Yet another ignorant mistake. Always take gloves on when you feel fingers go cold. So I left with 9 dogs for the final stretch to the finish with Thor and Bo in lead. 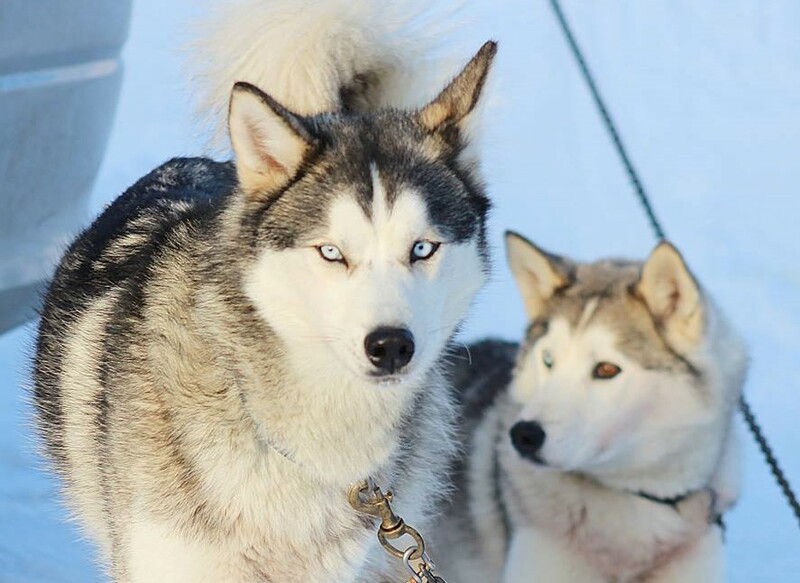 The dogs were doing great all the way and when we passed the icehotel in Jukkasjärvi - where we had started the race, I thought we would be ‘home’ soon. However, that was quite optimistically as it was another 20 km. left. Those twenty kilometers seemed to take forever and a day. A long stretch on the river with scootertracks all over made the runnerplastic of the sled loose its glide and it felt like we were going slow. There had been a lot of scooter traffic on the river from the ice hotel to Kiruna airport, where the finish of the race was. At this time of night it was just quiet and desolated. When we got on to land and I looked behind, I imagined to see a glimpse of a headlight in the distant so I was sure we were going to be overtaken sooner or later. It was so cold and I should have worked a bit in order to keep warm but I was not sure on the trail and tried to keep focus as to not drive wrong. My hands were frozen stiff and my mittens slightly wet so my fingers started to go numb. It felt like I soon would fall off and had to talk to myself to keep awake. When almost all the trail had been flat, it was tough to be confronted with a climb from the river towards Kiruna. "What a bummer!" The dogs were working fine and steady, but I could see that they started to notice my mood, looking back at me several times. I realized I had to keep ‘playing happy’ for the dogs and was glad with their motivation while they thrived in these temperatures! It was me, being the weak link. A lesson learned is to take dry mittens and more cloth on before one gets cold and tired. My fingers were white and quite frostbitten when we finally came to the finish at 1:34 hrs. in the night, but I was so happy with the performance of the dogs and especially proud of 2-year old rookies Erasmus, Voltaire, Lorentz and 19 months old Pamuk who all were in competition for a place on my Finnmarksløpet team now. We finished the Tobacco Trail in 3. place of 13 entries. This gave us bronze medal in the Scandinavian Open Championships LDU* Open, silver medal in the Swedish Championships LDU Open and we would have won the gold medal if there would have been a Purebred SOC class (there were 3 starting Siberian Husky teams which is needed for a class, but I would have been forced to return my open class medals in that case, even though all three different Scandinavian countries; Sweden, Norway and Finland were represented). However, the team did get a prize for Best Purebred team which was a much appreciated gesture. Similar to Vildmarksracet, Tobacco Trail did not attain merit status from the Swedish Polar Dog Club so these races do not give points towards Swedish working champion status. A true pity, because Sweden has not many long distance races, yet it is in those races the breed is tested according to its standard. Our dogs; Puak, Bo, Molly, Kvitten, Flapper, Erasmus, Voltaire, Lorentz, Pamuk, Kahlo, Rohn and Thor who was leading very strong from start to finish. Kiruna Sled dog Club and in particular Taisto Torneus and Birgitta Fernström for organizing the race. Birgitta and Lars Fernström for their great hospitality, providing us room and boarding. Birgitta and Mikael Sandin for their hospitality and overnight room on our way back from Kiruna. Kim Dulk for taking care of our dogs at home. Sponsor Anna Waldensten Pamuk of Fjällveterinären to whom our youngster Pamuk is called after. (She helped to deliver him, one day late of his siblings) for sponsoring us with outdoor clothing. Steinar Bergheim for building a light and flexible sled. I 'test' drove it on the race and it got approved with high remarks. And to all who supported and congratulated us.